Doom metal, stoner metal, groove metal, to me it's all the same thing. What's different is what the singer sings about. Are they singing about illicit substances? Oh then it's stoner metal. Are they singing about demons from hell coming to drag you down? Oh, ok that's doom metal. What's funny to me is that the originators of Heavy Metal, and whatever you want to call this particular sub-genre, sang about both things...think about Sweet Leaf or Snowblind and then Black Sabbath or N.I.B. The Sabs definitely never chose a direction...but I suppose neither has High On Fire. We've lost the plot. Wicked Inquisition has just released their debut album full of whatever you want to call this metal. I was floored by their album and thankfully Nate Towle was willing to talk to me about it. Glacially Musical: Let's start off with some housekeeping. Tell me about how you came to start this band? 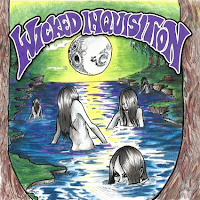 Wicked Inquisition: Basically, I started the band at the age of 14 with a childhood friend named Ben Ackerman. We started out playing Black Sabbath, Pentagram, Saint Vitus, and Witchfinder General covers before venturing into our own songwriting. GM: What made you want to pick up the guitar and play? WI: A combination of things; my older brother played guitar, so that inspired me. After that though, I'd say Tony Iommi of Black Sabbath. GM: Who are your top five influences? Bands: Black Sabbath, Trouble, Budgie, Blue Oyster Cult, Pentagram. Guitarists: Tony Iommi, Tony Bourge, Bruce Franklin, Victor Griffin, Leigh Stephens. Vocalists: Wino Weinrich, Lemmy, Eric Wagner, Bobby Liebling, Ozzy Osbourne. GM: What do you want people to see in their minds when they hear your music? WI: Whatever comes about - I hope that our songs can mean certain things to people and be applicable in their lives personally. GM: Let me ask the dreaded genre question. Which of the 8,087 metal subgenres do you think you fit into? WI: Probably traditional doom metal, though we have influences from outside of the genre. GM: When I listen to your music, I hear Sabbath styled riffs with Metallica styled tone. Was that intentional or am I hearing something way off base? WI: Sabbath style riffs for sure, but I wouldn't say Metallica's tone is something we really strive for. I guess you could associate the two in the sense that our album does have modern production. If anything, our tones are inspired by Bruce Franklin and Rick Wartell of Trouble, though that does not mean that we are necessarily trying to rip their tones off. comparison to other doom bands, so we typically don't want our tones saturated in fuzz. GM: Tell me about the first time you performed live "professionally." WI: I guess I could say it was a show in a small venue in 2009; the setlist consisted of all covers. Sabbath, Pentagram, Witchfinder General. I guess the definition of "performing professionally" can mean different things though. I can't say I've seen a massive amount of money from a specific gig or anything like that.